Students often ask how fiber is made. It's certainly not obvious how something only 1/8 of a mm - 0.005 inches - in diameter can be made with such precison. Some basic facts about how optical fiber is manufactured may help to provide a better understanding of how optical fiber works too. As you know, there are two main types of optical fiber: single-mode and multimode. 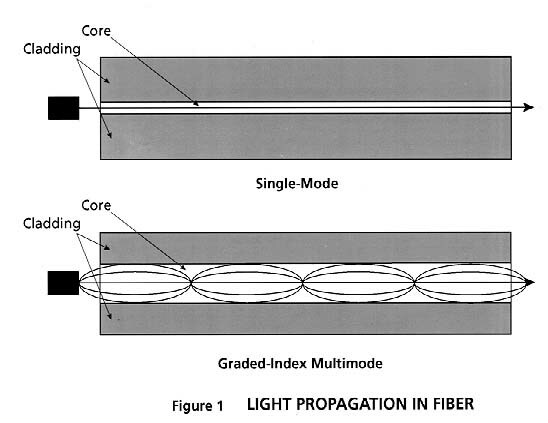 Both types of fiber are composed of only two basic concentric glass structures: the core, which carries the light signals, and the cladding, which traps the light in the core (Fig. 1). Single-mode fiber has a smaller core -- only 9 microns in diameter - and only 6 times the wavelength of light it transmits. The small core size limits the transmitted light in the fiber to only one principle mode, which minimizes dispersion of light pulses, increasing the distance the signal can be sent. Multimode fiber has a large core diameter compared to the wavelength of the transmitted light 50 or 62.5 microns. Therefore, multimode fiber propagates more than one mode of light. With its relatively large core, multimode fiber suffers more dispersion than singlemode. Using a graded index core, where layers of light have lower index of refraction as you go further from the center of the core, minimizes dispersion but complicates the manufacturing process. The first step in manufacturing glass optical fibers is to make a solid glass rod, known as a preform. Ultra-pure chemicals -- primarily silicon tetrachloride (SiCl4) and germanium tetrachloride (GeCl4) -- are converted into glass during preform manufacturing. These chemicals are used in varying proportions to fabricate the core regions for the different types of preforms. The core composition of all standard communication fibers consists primarily of silica, with varying amounts of germania added to increase the fiber's refractive index to the desired level. Single-mode fibers typically have only small amounts of germania and have a uniform composition within the core. Multimode fibers typically have a much higher refractive index, and therefore much higher germania content. Also, the core composition and the refractive index of graded-index multimode fibers changes across the core of the fiber to give the refractive index a parabolic shape. There are several methods used to manufacture preforms. In the Modified Chemical Vapor Deposition (MCVD) process, the highly controlled mixture of chemicals described above is passed through the inside of a rotating glass tube made of pure synthetic SiO2. The process is repeated for many hours as each subsequent core layer is formed. For every sweep of the burner, the manufacturer can modify the composition, viscosity and thickness of the deposited layer in order to produce specific fiber designs. This, in conjunction with the ability to change the speed at which the burner moves and the temperature of the flame, gives us the ability to manufacture a wide range of ultra-pure optical fiber types. The precise delivery of chemicals is ensured through the design of manufacturing equipment that performs accurately and consistently. For example, mass flow controllers are used to meter chemicals for the reaction. 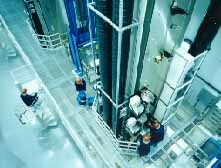 All critical process parameters are monitored and controlled in real time by on-line computers that are also programmed to collect all pertinent process data. 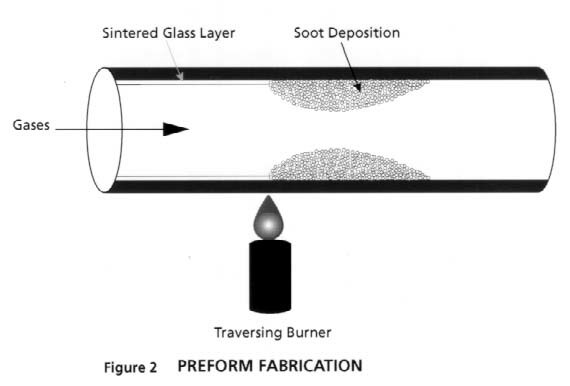 After the desired amount of core material is deposited the chemical flow is eliminated, the speed of the torch is decreased and the temperature of the flame is increased so that the tube collapses into a solid rod. At the end of this process, an operator separates the preform from the rest of the glass assembly and moves it to the next step. The entire preform manufacturing process is highly automated with minimal human involvement. The refractive index of the manufactured preform is measured using a preform analyzer. This instrument measures critical core parameters and compares them to internal specifications. All pertinent parameters are plotted automatically on statistical control charts that the operators review for every measurement. The pure silica glass starting tube has become part of the cladding region of the preform. The cladding region is further increased by the "sleeving" or "overcollapse" process. Here, another pure silica tube is collapsed on the outside of the original preform, bringing the geometrical dimensions of the preform to final specifications. Another process used is Outside Vapor Deposition (OVD), where the soot is deposited on the surface of a "bait rod" made of pure silica. The first layers are the core then the cladding is added. After all the layers are deposited, the bait rod is removed and the preform is headed and collapsed in a similar way to the MCVD process. The next step in the process of producing optical fibers is to convert the manufactured preform into a hair-thin fiber. This is done in an operation called fiber draw (Fig. 3). The tip of the preform is lowered into a high-purity graphite furnace. Pure gasses are injected into the furnace to provide a clean and conductive atmosphere. In the furnace, tightly controlled temperatures approaching 1900°C soften the tip of the preform. Once the softening point of the preform tip is reached, gravity takes over and allows a molten gob to "free fall" until it has been stretched into a thin strand. 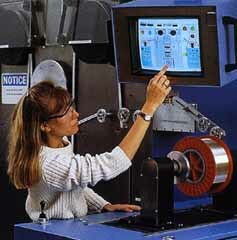 The operator threads this strand of fiber through a series of coating dies, and the drawing process begins. The fiber is pulled by a tractor belt situated at the bottom of the draw tower and then wound on winding drums. During the draw, the preform is heated at the optimum temperature to achieve an ideal drawing tension. Draw speeds of 10 - 20 meters per second are not uncommon in the industry. During the draw process the diameter of the drawn fiber is controlled to 125 microns within a tolerance of only 1 micron. 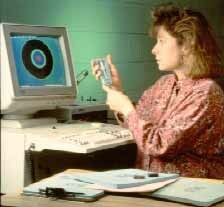 A laser-based diameter gauge is used to monitor the diameter of the fiber. The gauge can sample the diameter of the fiber at rates in excess of 750 times per second. The actual value of the diameter is compared to the 125 micron target. Slight deviations from the target are converted to changes in draw speeds and fed to the tractor mechanism for correction. If the diameter of the fiber increases above its target, the drawing speed is increased; if the fiber diameter starts falling below the target, the draw speed is decreased. Typically, 125 micron diameter control is achieved within a six sigma interval of the 1 micron tolerance. A two layer protective coating is then applied to the fiber -- a soft inner coating and a hard outer coating. This two-part protective jacket provides mechanical protection for handling while also protecting the pristine surface of the fiber from harsh environments. These coatings are cured by ultraviolet lamps. The drawing process is well automated and requires virtually no operator interaction after the threading step. The drawn fiber is next tested, where all optical and geometrical parameters are checked to ensure that they meet stringent requirements. First, the tensile strength of the fiber is tested. Each spool of drawn fiber is wound through a series of capstans and subjected to loads to ensure that the fiber has the minimal tensile strength specified. The fiber is then spooled onto shipping reels and cut to specified lengths. The fiber is tested for point defects with an Optical Time Domain Reflectometer (OTDR), which uses scattered light to indicate the location of any anomalies along the length of the fiber. Finally, the tested fiber is ready for cabling to protect the fiber and then installation.